Project Size 166,500 sq. ft. Architect Gensler & Associates Inc., Chicago, Ill. Engineer Bob D. Campbell and Company, Kansas City, Mo. This 166,500 square-foot building will serve as a destination point for students who are determined to move business forward. From state-of-the-art technology to research labs, this will be a hub for collaboration and innovation. The four-story building has 18 classrooms, 125- and 350-seat auditoriums, 205 offices, and labs and spaces for students’ use. 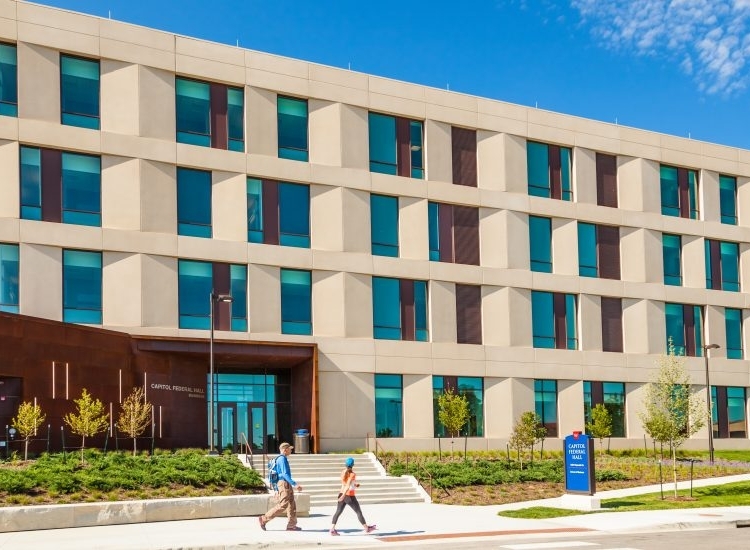 Building on the momentum of its national ranking and increasing enrollment, this University’s School of Business needed a new facility to sustain its energy and create a campus-wide culture of entrepreneurship. This entrepreneurial spirit inspired the design to promote multiple manifestations of “connectivity” through building shape, programmatic relationships and spatial weaving. Programmatically, the design turns the typical academic model on its side. Counter to traditional, vertically stacked relationships of faculty over students, the design places faculty and students on the same level, creating opportunities for serendipitous interaction and innovation. The shift from traditional academic models carries through the interiors with precedents in academic incubators, co-working spaces and start-up offices. 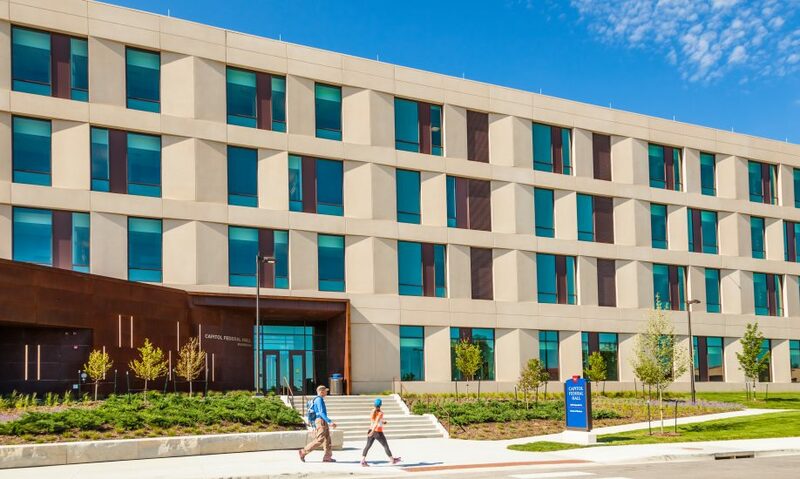 The building form further reinforces connections to campus through geometry and sectional properties. Campus activity is guided around and through the building via dynamic shapes of the North Wing and Auditorium. The North Wing bends to create a visual alignment with the iconic Fieldhouse that is home to the University’s legendary basketball program. The section of the building steps down the hill, mimicking the hilly topography of campus and creating interior “social steps” allowing students to see and be seen. An expansive four-story atrium serves as a connector between the building’s major program elements and variety of informal spaces. Transparency between informal spaces, offices and meeting rooms accentuate the continuous space of the atrium. Hues of blue, weathered steel, glass and precast. The visual flexibility and modular nature of precast made it a natural choice for the majority of the exterior façade. Combined with the other building elements, this is a great example of precast playing well with other materials. This School of Business building form is truly a representation of its internal program expressed in the form of its architecture. Designed to catalyze connections, the Hall turns the typical campus model –student spaces on lower levels, faculty above –on its side. An expansive four-story atrium serves as a connector between the building’s major program elements –student incubator, labs, 21 classrooms, 200+ offices and conference areas –while also housing a variety of informal gathering spaces. Every element is designed and placed to prompt serendipitous interactions, making the school a venue for entrepreneurial innovation. Looking to mimic the hilly topography of its campus, the building’s “social steps” allow students to see and be seen, encouraging these chance encounters to occur. Designers realized that students and faculty had to see each other while going about daily routines to promote new kinds of interactions. To that end, designers crafted sight lines to connect spaces that were previously isolated: faculty workspaces and student classrooms. Staggered floors and openings further drive a sense of awareness and connectivity. In a marked shift from traditional academic design, the school’s interiors are more closely related to academic incubators, co-working spaces and start-up offices than they are to typical classrooms, libraries, or laboratories. The design offers students a glimpse of where they could go after they make the leap from campus to workplace. Architects designed flexible interior spaces that offer cues to people using them, to motivate people to connect in new ways. concrete weave through the building and beyond into the campus through the exterior ends of the atrium. This Innovative School of Business consists of two wings connected by a central atrium. This complex project was completed ahead of schedule and under budget. Preparing the building site required complex site utility relocation and utility tunnel sequencing to maintain campus services and was an early schedule critical phase important to maintaining the project schedule and begin building construction on time. Extensive use of Building Information Modeling (BIM) during preconstruction for coordination of overhead MEP services resulted in zero ceiling height changes and reduced the overhead MEP rough in work from 40 days to 25 days per floor per wing. As a key design decision early on: What would have traditionally been done with architectural cladding was done with a series of insulated panels to fully take advantage of the high performance characteristic of the product. From an aesthetic standpoint, different forming systems on each side yielded unique, varying appearances on each side. 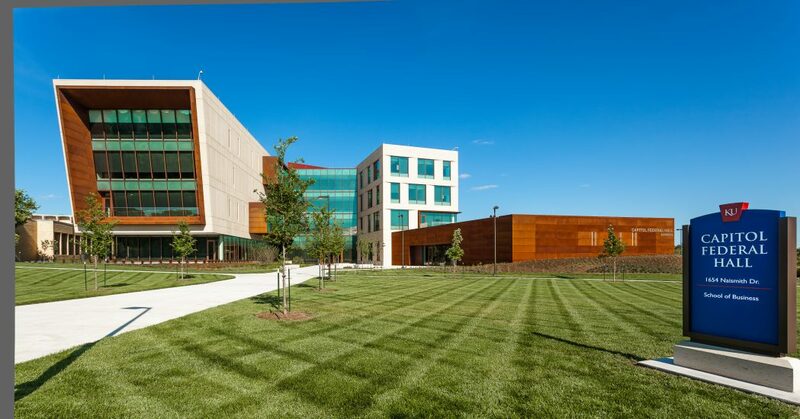 Color and finish uniformity of the cream colored precast panels is accented by a series of copper panels that accent to look in various areas. Combined with the glass and steel this is truly an example of precast playing well with other materials. “Both for the aesthetic honesty of materials and for the savings of cost in building an interior wall, the design exposed the precast at the interior. Panel construction of 4” mix, 4” insulation, and 4” mix was also selected for its insulating value and efficiencies. 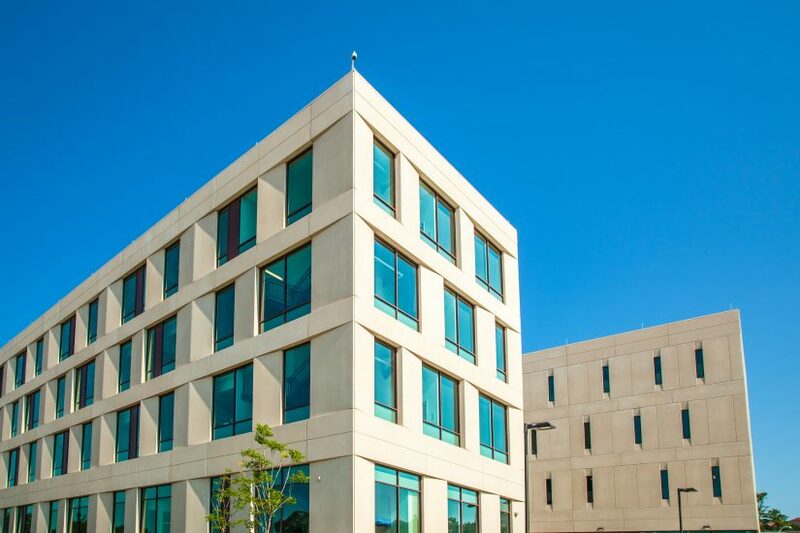 Having the Precast exposed gave us a durable, lower maintenance solution while also giving us all the energy efficiency benefits of an insulated precast panel. Aesthetically, the slight inset of the panel allowed for a great looking shadow effect, which varies as the sun moves. A unique characteristic of this panel design was it tapered out to a “V” pattern in plan. It was broken up as a 4-4-4 panel, but there were portions of the surface wythe of the panel that protruded out as much as 10″ at the apex of the “V”.